Mark - next time you are in this area, take the Rosebud exit (not Rosebud Creek Road, the other one) and drive about 8 or 9 miles on the gravel road to the south. You'll eventually pass the KIKC FM radio tower -- then a couple of miles past that you'll see a telephone microwave tower on the left. 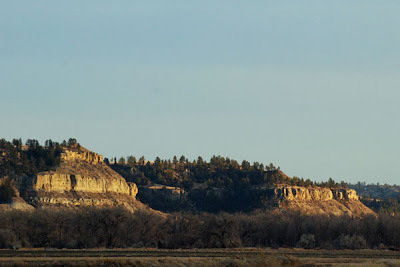 If you drive up to that tower, you'll be rewarded with one of the best views in this part of the state -- at night you can see Colstrip, Forsyth, the Rosebud area, and the glow of Miles City all from the same spot! I took this particular shot from the backroad that runs along the north side of the Yellowstone between Myers and Custer ... it's one of my favorite stretches of the river, partly because it's always kind of been off the beaten path.